Welcome to the Chalk’s Industrial Equipment Sales Inc. Service Department. We provide scheduled and unplanned service for a wide variety of forklifts. 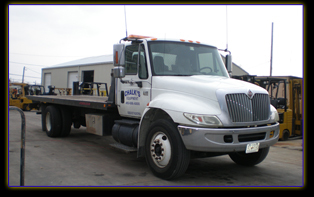 Chalk’s Industrial Equipment Sales Inc. offers on site repair service for your convenience. 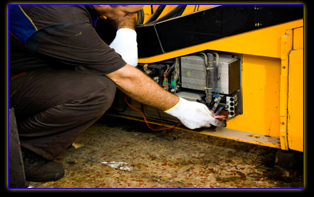 We understand that having your forklift out of service can directly impact your business. We minimize the downtime of your forklift by sending a skilled technician to your site promptly to assess the repair, we keep our service trucks stocked with various parts and tools, and get your forklift back into operation as quickly as possible. All repairs are performed at your site, if feasible. If we are unable to fix the repair at your site, we have a full service shop at our location. We understand that having your forklift out of service can directly impact your business. We provide service on propane, electric, gasoline, and diesel forklifts and all brands including all listed below. The most important thing to Chalk’s Industrial Equipment Sales, Inc. Service is customer satisfaction. We ensure courteous, prompt, reliable service at an affordable price. Need a forklift while yours is being repaired? We provide equipment rentals while your forklifts are being serviced. We also offer pick- up and delivery services for repairs brought to our shop. Please click on the Request an Estimate button below to fill out an online form to receive pricing or for further assistance. After submission, a forklift service representative will contact you during our regular business hours. You can also choose to call us at 410- 686-6800, or stop by our shop. Thank you for doing business with Chalk’s Industrial Equipment Sales, Inc. in Baltimore, Maryland!